Thank you for attending the Dallas Contributors Network luncheon hosted by Dallas Foundation & North Texas Asset Funders Network. We appreciate the opportunity to learn together the ways we can engage on the topic of housing. Our speakers have offered a number of resources, including specific recommendations on next steps for those interested in engaging further on this topic. Homeownership remains the primary wealth-building tool for middle-income families, especially for people of color, and one powerful way to reduce the racial wealth gap. Yet for growing numbers of families in Dallas, homeownership is increasingly out of reach due to lack of affordability and systemic inequities. Less wealth from homeownership by blacks and Latinos means less overall wealth. In turn, less wealth passes to the next generation and less homeownership introduces instability into the community. And the damaging cycle continues. Available housing choices increase or limit financial security. These choices must include a continuum of safe, affordable, timely, and sustainable ownership and rental opportunities. There are tools and strategies to make home buying easier and renting of quality affordable housing more beneficial. 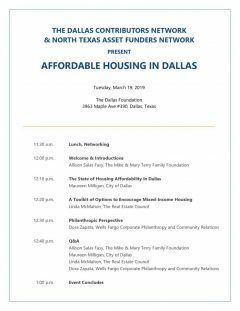 What is the current state of affordable housing in Dallas? 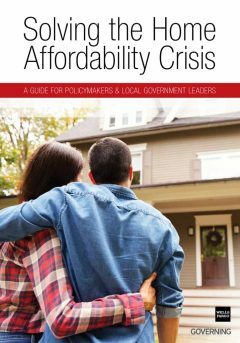 What are existing strategies to increase affordability? What innovations and best practices are replicable in Dallas? Where and how can philanthropy provide strategic support? Our speakers addressed these questions and more. (still in early stages and will be formalized in the coming months) The Real Estate Council will apply for funding from the Pro Neighborhoods program sponsored by JPMorgan Chase Foundation, and matching funding sources for their recommended execution steps will be required. In May 9, 2018, the Dallas City Council created a Housing Trust Fund to support the development and preservation of affordable housing units in the City of Dallas. On December 12, 2018, the City Council approved the transfer of $14 million into the Housing Trust Fund. The City of Dallas Housing Policy Taskforce is in the early stages of building out the Housing Trust Fund. Funders interested are invited to reach out in various aspects: the design of the Housing Trust fund, including sharing your expertise in fund development, grantmaking, and program evaluation so that the Housing Trust Fund is designed to operate effectively and efficiently. 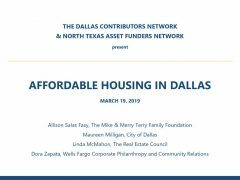 Additionally, by engaging with the Dallas Housing Policy Taskforce, funders can identify synergies between the mission and goals of their organizations and the City of Dallas’ efforts related to affordable housing. An additional goal of the Housing Policy Taskforce is to create a “One Stop Housing Database” that allows low- and moderate-income households to identify housing units that are reserved for low- and moderate-income households (such as units in a housing development funded by Low Income Housing Tax Credits or through City incentives). A superb database would allow households to search for available units based on income, household size, and other criteria such as whether the landlord will rent to persons with a criminal record or who have pets. Additionally, such a database could be designed so that it, for example: (1) helps families find available units that are within certain school feeder patterns or that are along high-speed bus routes, and (2) automatically notifies families about their eligibility for other programs such as Pre-K or food assistance. While the City of Dallas could try to create this database in-house, creation of this “One Stop Housing Database” would be a fantastic undertaking for one or more philanthropic or non-profit organizations who already have data analysis and database management capacity (or who would be willing to develop this capacity). Additionally, once the database is created, it will be necessary to train individuals who work with low- and moderate-income families to help them navigate the new database. Communities across the country need similar things to thrive: access to good jobs, affordable homes, safe places to gather and play, healthy food options, and opportunities for residents to have a voice in decisions that affect the community. Research shows that outcomes like life expectancy and economic mobility are deeply influenced by where we live. Yet many places suffer from chronic disinvestment, resulting in communities where the most basic conditions necessary for a decent quality of life are not met. 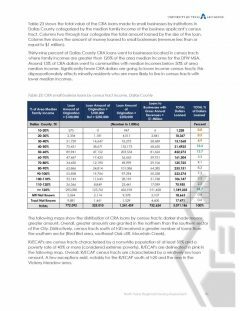 This brief is three parts in a series on the core functions of the Center for Community Investment’s (CCI) capital absorption framework. Jubilee Park received a wonderful gift of land from the State Fair. Ben Leal is a terrific leader and they’ve already done some neighborhood input events to learn what the community wants. It’s still early to know exactly what the housing product mix will be but they talk like they want an ownership and rental mix. Their board has already assembled a little team of architects, planners and engineers and they look like they’re teeing it up to do it right. Bonton Farms is already taking steps to provide housing as the ‘next step’ for their clients and participants. They bought and are fixing up a couple of rental properties. They’re looking into building homes out of shipping containers. Bonton will have an ownership/rental mix and intends to carry the mortgages themselves. There is interest in acquiring the old JR Gameroom site as well. Catholic Housing Initiative repurposes existing properties to develop very low-income housing (like the St. Jude project). They are currently all-volunteer (and operate about 800 units of affordable rental). They’ve done some great single-family, for ownership, in Oak Cliff, La Estrella. The Real Estate Council announced a 5 year pilot program to address issues of inequality in 3 neighborhoods in Dallas – Oak Cliff, West Dallas, and South Dallas and are working with nonprofit organizations like Builders of Hope CDC and others to launch and coordinate efforts. One of the issues being addressed is the lack of affordable housing. TREC also has an exciting project called the Dallas Catalyst Project – a neighborhood revitalization effort that includes partners from the City of Dallas, Cornerstone, St. Philips School and Community Center, and CitySquare. They do an incredible job of bringing pro bono resources through their members to support these and other initiatives. Collin County Habitat for Humanity has stepped out of the traditional Habitat housing model to do high-density housing built out of shipping containers. Trinity Habitat for Humanity is now building tiny homes. Dallas Habitat for Humanity continues to build new homes and their plan is to further their efforts in West Dallas and Joppa. Rebuilding Together North TX hosts an annual project called National Rebuilding Day where they bring together volunteers, corporate and private funders, to adopt a neighborhood and do repair work on the homes of elderly, disabled, veteran, and low income families. They have focus on veterans and low income families and have a year-long program called Homes4Heroes to address some of the renovation needs for veterans including making homes handicap accessible. Their partnership with NARI, the National Association for the Remodeling Industry gives them access to contractors who offer their services at a reduced cost. They also have a partnership with Texas Women’s University that allows them to assess the home renovation needs, particularly of disabled individuals, and then make recommendations. Dallas Habitat for Humanity A Brush with Kindness helps existing homeowners with necessary exterior repairs that they are unable to do themselves. Trinity Habitat for Humanity hosts their annual Cowtown Brushup to provide home renovations on existing housing and focus on a neighborhood at a time. First-time homebuyer education is also a critical need to ensure that families understand the basics of homeownership, including qualifying for a mortgage, owning vs. renting, etc. Some of our local providers include BCL of Texas, Catholic Charities of Dallas, Habitat for Humanity affiliates, East Dallas Community Organization, Housing Opportunities of Fort Worth, and Housing Channel.